Read our ten expert Insights and join the conversation. Governments around the around the world have picked up on innovation clustering as a way to stimulate jobs, productivity and economic growth. But innovation-as-usual is not delivering change at the necessary scale and pace to tackle climate change. Climate innovation clusters – built around local competitive advantages in the new climate economy – can become engines of local economic growth and increase the rate of change to a climate-resilient society and net zero-carbon economy. In this new series of expert insights, the authors argue that stimulating climate innovation clusters should be at the heart of job creation, skills and export plans at all levels of government. 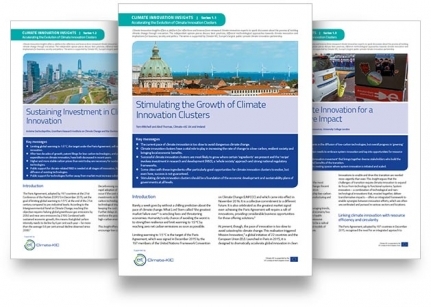 Accelerating the Evolution of Climate Innovation Clusters is a series of ten peer-reviewed insight documents written by renowned climate innovation experts. The series was commissioned by the UK & Ireland team to support our 2017-2020 focus on building climate innovation clusters in city-regions across the UK & Ireland. The series offers lessons, tools and an emerging evidence base for any city looking to put climate innovation at the heart of future jobs and skills strategies – and an expert overview for anyone who wants to understand the climate innovation cluster approach to regional economic development. why we think climate innovation clusters should be at the heart of job creation, growth and export plans at all levels of government. “This excellent series sets out the foundations of a plausible, climate innovation cluster approach to regional economic development, built around local strengths in the new climate economy." Where are climate innovation clusters emerging in the UK & Ireland and how can you or your city-region get involved?